Despite some incremental improvements, America’s infrastructure portfolio remains stuck at D+, according to the American Society of Civil Engineers (ASCE) quadrennial report card released March 9. That’s the same overall grade for 16 infrastructure segments—from aviation to wastewater—as in the group’s 2013 report. 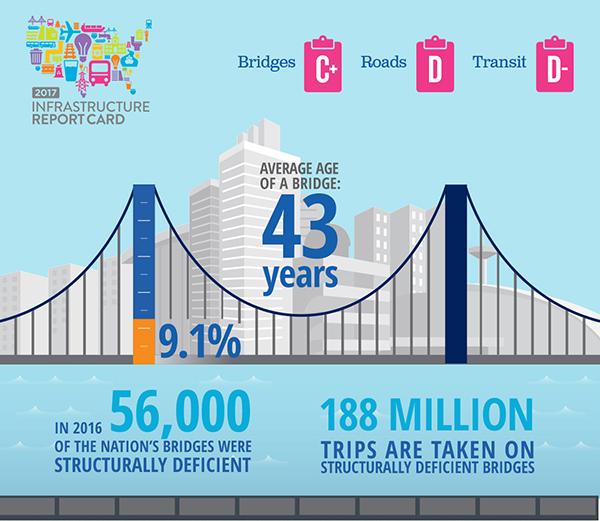 As ARTBA revealed in its annual U.S. structurally deficient bridges report released last month, ASCE notes the number of bridges in need of repair has slowly declined because government has made fixing them a greater priority. Investment level remains insufficient, however, and ASCE estimates the national bridge rehabilitation backlog at $123 billion. ASCE says the national transit backlog has grown to $90 billion as large systems such as the Metro in Washington, D.C., suffer high-profile breakdowns from too much deferred maintenance. The private freight rail system, however, gets credit for spending enough of its capital to help raise its grade to B, highest in the report and ASCE’s goal for all 16 infrastructure sectors. Non-transportation categories include drinking water, energy, solid waste and parks & recreation. ASCE recommends raising infrastructure investment from public and private sources to 3.5 percent of U.S. Gross Domestic Product by 2025, or 1 percentage point higher than the current level. The group says infrastructure owners and operators must be willing to charge—and Americans willing to pay—the true cost of using, maintaining and improving infrastructure. ASCE is calling for a 25 cents-per-gallon increase in federal motor fuels tax revenue for the Highway Trust Fund, plus future indexing. The gas tax hasn’t been increased since 1993. ASCE also says that infrastructure trust funds must be protected from being raided by politicians for use in other parts of local, state or federal government budgets.